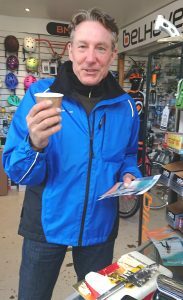 We had a great time on ‘Local Bike Shop Day’. Thanks so much to everyone who popped by, here’s a few pics of customers enjoying coffee and cake! 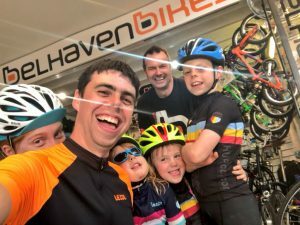 On the morning of ‘Local Bike Shop Day’ we were blown away with a wee film which Markus Stitz kindly put together from when he, and the bikepacking families, visited us during the filming of the ‘Go East Lothian Trail’ film. The impressive chain ring caused much enjoyment and hilarity! 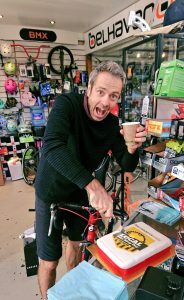 The inaugural, UK ‘Local Bike Shop Day’ takes place on Saturday 6 October 2018. This celebratory day was inspired by the success of UK Record Store Day which is now in its 12th year. 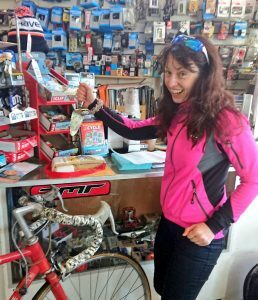 ‘Local Bike Shop Day’ hopes to take inspiration from Record Store Day and give smaller, independent stores an opportunity to highlight what sets them apart from the bigger national retailers, namely being at the centre of their communities, specialist knowledge, personal service, individuality, and their dedication to help cyclists get the most out of their cycling, whether they use their bike for leisure, commuting or competing. Drop in to see us on Saturday 6 October for a chat about all things bike. -And of course – Coffee & CAKE! The new ‘Bikepacking in East Lothian’ film, which features a certain local bike shop 😉 , is being released the week leading up to ‘Local Bike Shop Day’. The film, commissioned by East Lothian Council, stars The Jones family , Jig and Lachlan Johnson and is filmed and narrated by Markus Stitz. Check out a clip from the new ‘Bikepacking in East Lothian’ film and some more photos are available here. More information about the ‘Go East Lothian Trail’ is available here.